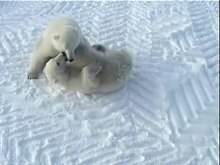 Polar Bears fighting in the wild! The polar bear (Ursus maritimus) is a large bear which lives in the Arctic. It is also called white bear or northern bear. It has black skin under the white fur. They are strong and fast, and can run as fast as 25 miles (40 km) an hour for a short distance. Polar bear fur is made up of a layer of dense underfur and an outer layer of "guard hairs", which appear white to tan but are actually translucent. The fur keeps them very warm. The skin is not white; it is black. Therefore, they can absorb sunlight efficiently. They are strong and can swim very well. Polar bears are similar in size to a normal bear but have a slimmer neck, longer legs and fur. The polar bear was the most dangerous animal to hunt. It was also greatly respected for its strength and spirit. The bear's blubber, meat, and fur all help the Inuit survive. The Inuit gave thanks and respect in turn. After a hunt, they held a celebration that lasted for several days. Then, a polar bear dance was held. Finally, the bear's skull was set on an ice floe to release its spirit back into the Arctic. A polar bear's paws are perfect snowshoes for them. The bottoms are wide and covered with fur to help keep the bear from slipping. The sharp claws help grip the ice. The polar bear's liver contains a lot of vitamin A. Inuit people knew that eating the liver could cause sickness and death. Several groups of European polar explorers were seriously ill after eating livers. The symptoms included drowsiness, wanting to sleep, being irritable, headaches, and vomiting. After 24 hours, people's skin began to peel off. 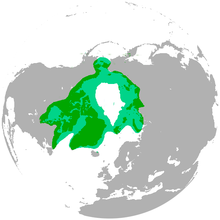 Wikispecies has information on: Ursus maritimus. Wikimedia Commons has media related to Ursus maritimus. ↑ Wiig, Ø.; Amstrup, S.; Atwood, T.; Laidre, K.; Lunn, N.; Obbard, M.; Regehr, E.; Thiemann, G. (2015). "Ursus maritimus". The IUCN Red List of Threatened Species (IUCN) 2015: e.T22823A14871490. doi:10.2305/IUCN.UK.2015-4.RLTS.T22823A14871490.en. http://www.iucnredlist.org/details/22823/0. Retrieved 13 December 2017. ↑ DeMaster, Douglas P.; Stirling, Ian (8 May 1981). "Ursus Maritimus". Mammalian Species 145 (145): 1–7. doi:10.2307/3503828. OCLC 46381503. ↑ "WWF - Facts about polar bears". wwf.panda.org. 2011. Retrieved August 31, 2011. ↑ Cole, Joanna (2000). The Magic School Bus, Polar Bear Patrol. U.S.A. ISBN 978-0-439-31433-6. ↑ 11.0 11.1 11.2 11.3 "Vitamin A in Bear Liver". Retrieved 6 August 2010. This page was last changed on 18 March 2019, at 16:31.